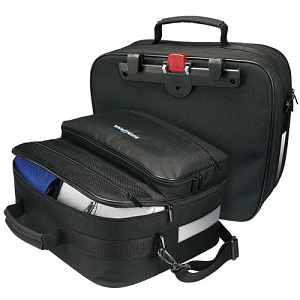 This is a comfortable, elegant pannier for travel or business, with foam-supported shape. It is well-organized and offers an outer net compartment, big front compartment and several inner compartments. Handle, detachable shoulder strap, reflectors on both sides, separate rain cover are included features. Two-way zippers allow convenient access. Included Universal adjustable rail features flexible handle and could be used with racks of all sizes. The UNIVERSAL rail comes with adjustable standard hooks that fit tubing diameter Ø 8/10/12mm and additional 16mm hooks. The lower catch prevents the bag from swinging sideways. Because of symmetrical rail position, this bag can be used on either the right or left side and is therefore sold as a single bag.